The 38th regular session of the Human Rights Council (HRC38) was held from Monday 18th June to Friday 6th July 2018. On 18th June, H.E. Mr Zeid Ra’ad Al Hussein, presented his last oral update as High Commissioner for Human Rights on the global human rights situation. His successor is expected to be selected by UN Secretary-General Antonio Guterres over the summer. A number of dignitaries delivered statements during the session, including inter alia, H.E. Mr Borut Pahor, President of Slovenia, H.E. Ms Karin Kneissl, Federal Minister for Europe, Integration and Foreign Affairs of Austria, H.E. Mr Boris Johnson, Secretary of State for Foreign and Commonwealth Affairs of the United Kingdom, H.E. Mr Mohammad Farid Hamidi, Attorney General of Afghanistan, and H.E. Mr Hassan Al Tawadi, Secretary General of the Supreme Committee for Delivery and Legacy of Qatar. On 19th June, the second day of the Council session, the United States announced its withdrawal from membership of the Council. This is the first time in the Council’s history that a State has voluntarily relinquished its seat. Four panel discussions were held during the session. More than 95 reports under the various items of the Council’s agenda were considered. More than 220 side events were held by States and/or NGOs. The outcomes of the UPR Working Group reviews of the following 14 countries were adopted: France, Tonga, Romania, Mali, Botswana, Bahamas, Burundi, Luxembourg, Barbados, Montenegro, United Arab Emirates, Israel, Liechtenstein. and Serbia. Five new Special Procedures mandate-holders were appointed to the following mandates: Special Rapporteur on the issue of human rights obligations relating to the enjoyment of a safe, clean, healthy and sustainable environment; Special Rapporteur on the situation of human rights in the Islamic Republic of Iran; two members (one each from the African Group and the Eastern European Groups) for the Working Group on the issue of human rights and transnational corporations and other business enterprises; and one member (from Western European and other States) for the Working Group on the use of mercenaries as a means of violating human rights and impeding the exercise of the right of peoples to self-determination. 20 texts (all resolutions) were considered and adopted by the Council. 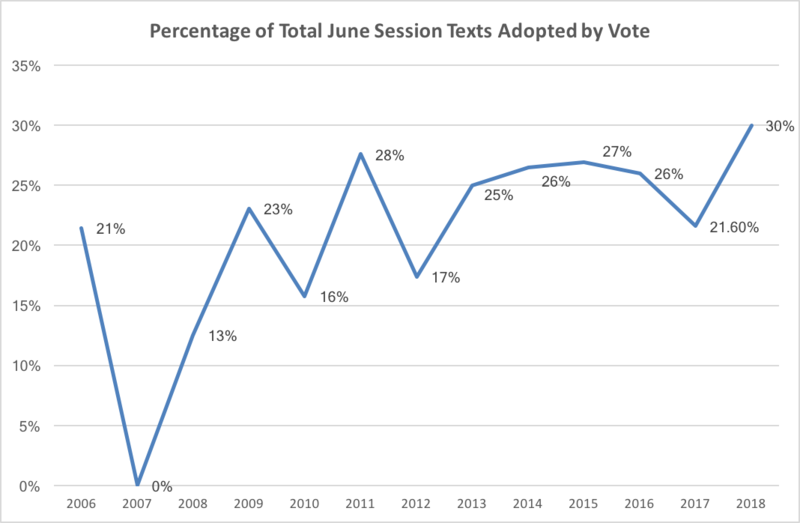 This represents a significant decrease (46% drop) compared to last June (HRC35), when 37 texts were adopted (a record for a June session). This appears to be the result (somewhat belatedly) of the efficiency drive launched by the ninth President of the Human Rights Council, H.E. Mr Joachim Rücker in 2015, and of the ongoing ‘strengthening’ process being led by the current Council Bureau. Of these 20 resolutions, 14 were adopted by consensus (70%), and 6 by a recorded vote (30%). 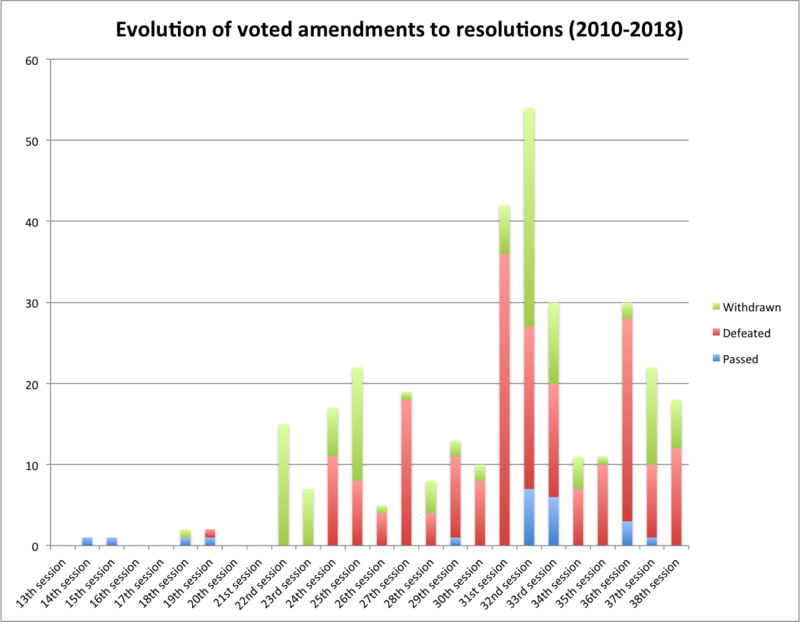 18 written amendments were put forward by States during the consideration of resolutions – none were adopted by a vote; 12 were rejected by a vote; and six were withdrawn. 13 of the texts adopted by the Council (65%) had Programme Budget Implications (PBI) and 10 required new appropriations not included in previous Programme Budgets. The total costs of the newly mandated activities amounted to a total of $1,907,500 (at the moment of writing). In his regular – and final – global update to the Council, H.E. Mr Zeid Ra’ad Al Hussein, the UN High Commissioner for Human Rights, reflected on attacks on universal rights perpetrated by violent extremists and authoritarian leaders around the world. He concluded that the greatest tragedies to afflict the modern world have been caused by chauvinistic nationalism, and that the UN was established to prevent the return of such forces. In the face of these challenges, he criticised many UN member States for operating only in their national self-interest and ignoring the common good. He called on all parts of the UN, including his Office, to speak out in support of universal norms and principles, and to defend shared multilateral institutions. Turning again (as he has repeatedly over recent years) to the issue of member States’ cooperation with the UN human rights system, the High Commissioner reported that a number of States continue to routinely deny access to his Office or Special Procedures mandate-holders, including, inter alia Syria, Myanmar and Venezuela. The High Commissioner reminded States of his Office’s unquestionable and unassailable mandate to conduct human rights monitoring where there are reasons to believe serious violations are occurring. Seen from a different angle, the High Commissioner explained that, by providing access and working in cooperation with the UN, States can avail themselves of OHCHR technical support to help improve implementation and compliance with their human rights obligations and commitments. Regarding cooperation with Special Procedures, he noted that almost 40 States have not received any visits by Special Procedures over the past five years, despite numerous requests. Amongst those States, 15 have over five or more pending visit requests, including inter alia: Belarus, Democratic Republic of the Congo, and Yemen. The High Commissioner also deplored the practice of certain States to formally refuse coopearation with the Council’s Independent Expert on sexual orientation and gender identity. He expressed concern at the severe and often officially-sanctioned discrimination faced by LGBTI people, and reaffirmed that the protection of all human beings, including members of the LGBTI community, is central to the principles and work of the Council. The High Commissioner also reported on a number of positive developments with regard to access and cooperation. In this regard, he commended a number of States including inter alia Chile, Ethiopia, Kazakhstan, Sri Lanka, Uzbekistan and Zimbabwe. He welcomed the fact that Chile, Kazakhstan and Sri Lanka have hosted at least five thematic Special Procedures mandate-holders over the past five years. Regarding engagement with the Treaty Bodies, the High Commissioner recognised that, inter alia, the Central African Republic, Mali and Tonga had submitted long-overdue periodic reports. Finally, Mr Zeid Ra’ad Al Hussein underscored the synergies between the implementation and prevention agendas, noting that implementation of UN human rights recommendations reinforces inclusive societies, sustainable development and peace. Thus the domestic implementation of international human rights obligations and commitments helps build resilience in societies (‘tolerant communities, which can live in peace’) – thereby contributing to the prevention of violations and crises. Seen the other way around, States and world leaders must avoid undermining human rights in the name of patriotism or nationalism, or risk creating instability. The Trust Fund for the participation of LDCs and SIDS in the work of the Council (set up in 2012) funded the participation of eight (seven female and one male) government officials at HRC38, from Jamaica, the Marshall Islands, Mauritius, Samoa, Seychelles, Sudan, Tonga and Zambia. For all of them, it was the first time they had participated in a Council session. During the session, the Trust Fund, in cooperation with the Permanent Mission of Denmark, celebrated the 100th beneficiary delegate. 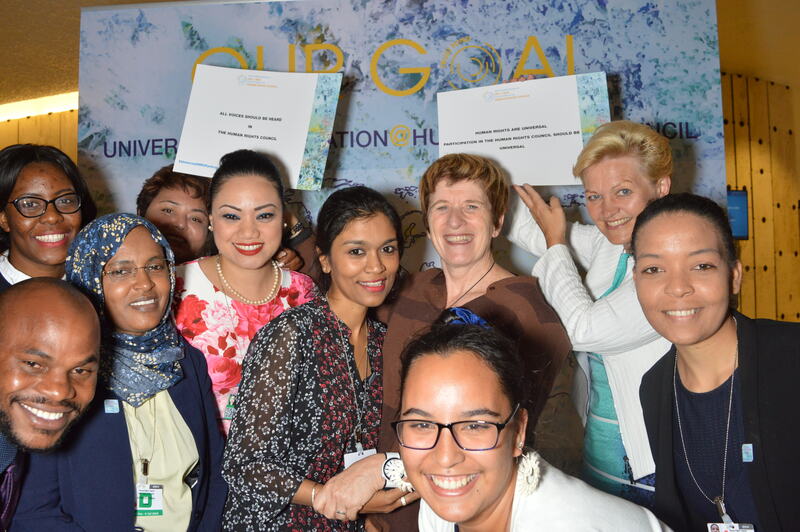 The occasion was marked by a side event and the opening of a ‘Photo booth’ to highlight the importance of universal participation and representation at the Human Rights Council. During an interactive dialogue at HRC38, the Commission of Inquiry (COI) on Burundi delivered an oral update. The Commission’s chairperson, Mr Doudou Diène, noted that the human rights situation in Burundi remains ‘very disturbing.’ Ms Françoise Hampson, member of the Commission, remarked that since the beginning of 2018, serious human rights violations including, inter alia, extrajudicial executions, enforced disappearances, and torture, inhuman or degrading treatment, had continued to take place against those opposed to the proposed amendment to the Constitution. She added that Burundian authorities have not carried out investigations in this regard. Ms Lucy Asuagbor, member of the Commission, noted that the Burundi’s President had nurtured an environment of threats and intimidation, encouraging further hostility and violence. Burundi, speaking as the concerned State, rejected the oral update. It claimed that the Commission of Inquiry does not possess the necessary expertise to correctly analyse and understand the situation in the country. In response, Mr Diène argued that the only way to truly and objectively ascertain the facts of the situation, and to secure accountability for serious human rights violations, would be for Burundi to grant full access to the COI and let it do its job. On the 26 June, States held an interactive dialogue with the Commission of Inquiry on the Syrian Arab Republic. Chairperson Mr Paulo Sérgio Pinheiro noted that the situation in eastern Ghouta had been foreseeable and preventable. He stated that the overall conflict had seen some of the most brutal human rights violations perpetrated in modern human history. Innocent civilians have suffered the brunt of the violence, with six million Syrians now internally displaced (so far 920,000 have been displaced in 2018). Mr Pinheiro stressed that the only way to end the conflict is to give due effect to Security Council resolution 2254. Ms Karen Koning, a member of the Commission, stressed that children were the most vulnerable group affected by the conflict. They have been terribly affected by, inter alia, malnutrition, lack of access to education and their recruitment into armed groups in the northern part of the country. Mr Hanny Megally, also a member of the Commission, highlighted a new report on sexual violence by the Commission. Syria, speaking as the concerned country, said that the Commission’s report was riddled with false statements, mistakes and contradictions. It pointed out that the Commission had ignored witness accounts, and disregarded the right of the State to defend itself from non-State armed groups. The Council adopted the UPR outcome reports of France, Tonga, Romania, Mali, Botswana, Bahamas, Burundi, Luxembourg, Barbados, Montenegro, United Arab Emirates, Israel, Liechtenstein. and Serbia. A total of 2,632 recommendations were made to these 14 States, out of which 1,703 were accepted in whole or in part, 66 were partially accepted, and 863 were noted or rejected. Israel was not present during the consideration of the outcome of its Universal Periodic Review and the adoption of the report. This was designed to demonstrate solidarity with the US, which withdrew from the Council earlier in the session due to what it sees as the body’s unfair targeting of Israel. Notwithstanding, a State’s absence from the adoption of its UPR outcome is less serious than refusal to participate in the review itself (i.e. in the UPR Working Group). 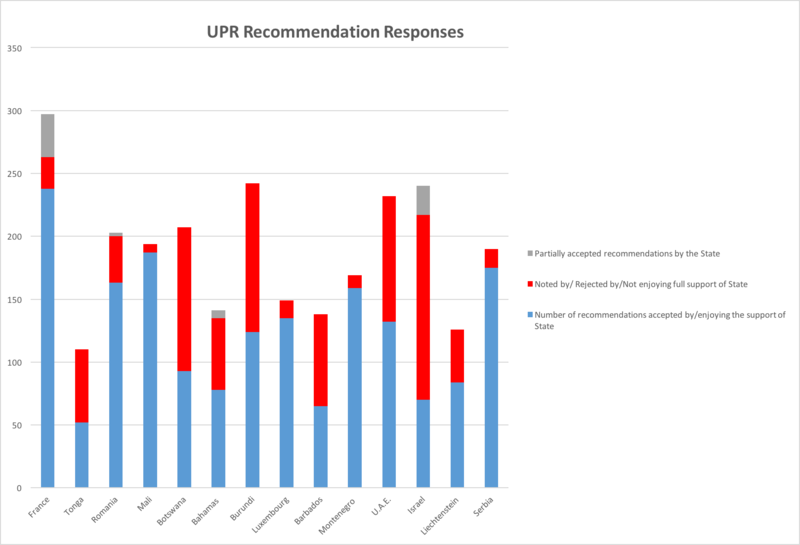 For the moment, the UPR maintains a 100% participation record in those reviews. During the general debate under item 6 (UPR), held on 29 June, Togo delivered a statement on behalf of the African Group on the importance of proper implementation and follow-up. In it, African States called upon their peers in the UPR Working Group to present a ‘manageable number of qualitative and realistic recommendations which would thereby help to ensure their implementation by the State under review.’ Togo further asked for increased attention to implementation and follow-up ‘through national coordination structures and inclusive approaches.’ The African Group also drew attention to the implementation challenges faced by developing countries, especially LDCs and SIDS, and thus recalled the crucial importance of technical assistance and capacity-building support. Paraguay, on behalf of the 28 members of the ‘group of friends on national implementation, reporting and follow-up,’ also delivered a statement focused on mobilising technical assistance and capacity building to support national implementation. Paraguay drew particular attention to report HRC/38/27 of the Secretary-General on the operation of the UPR technical assistance trust fund. Paraguay noted that the Secretary-General’s report expresses his support for the development, in many countries, of ‘national mechanisms for implementation, reporting and follow-up’ (NMIRFs). Paraguay said NMIRFs hold enormous potential to generate new ‘momentum’ behind implementation – for both human rights and the SDGs. Paraguay, on behalf of the group of friends, encouraged States that wish to improve implementation, particularly through the creation or strengthening of NMIRFs, to request technical cooperation through the UPR trust fund. The Russian Federation, speaking on behalf of a cross regional group of 22 States, took note of OHCHR’s new practice of sending letters to States after their UPR, highlighting recommendations that the Office believes require special attention. According to the Russian statement: ‘such a practice of establishing a hierarchy among recommendations is unacceptable.’ The group of States further underscored that the role of OHCHR in the UPR is clearly defined in paragraphs 15-19 of Council resolution 5/1. In its statement on behalf of the EU, Bulgaria noted that the involvement of ‘NGOs and national human rights institutions is essential to ensuring that the UPR process has a real and tangible impact on the ground.’ The EU also noted the importance of national parliaments in implementing UPR recommendations. Finally, the EU stressed the importance of protecting human rights defenders, and voiced concerns about reprisals against individuals who engage with UN mechanisms, including the UPR. David R. Boyd (Canada) was appointed as Special Rapporteur on the issue of human rights obligations relating to the enjoyment of a safe, clean, healthy and sustainable environment. Javaid Rehman (Pakistan) was appointed as the Special Rapporteur on the situation of human rights in the Islamic Republic of Iran. Githu Muigai (Kenya) was appointed as member of African States to the Working Group on the issue of human rights and transnational corporations and other business enterprises. Elzbieta Karska (Poland) was appointed as member from Eastern European States to the Working Group on the issue of human rights and transnational corporations and other business enterprises. Sorcha Macleod (United Kingdom) was appointed as member from Western European and other States to the Working Group on the use of mercenaries as means of violating human rights and impeding the exercise of the right of peoples to self-determination. To inform the appointments, the Consultative Group, made up of representatives of Ethiopia, Singapore, Azerbaijan, Ecuador and Israel, scrutinised around 56 individual applications for five vacancies. The Consultative Group sent its recommendations to fill the five vacancies to the Council President on 18 May 2018. On 4 June, having ‘held broad consultations in particular through the regional coordinators and based on the recommendations of the Consultative Group,’ the President, following exactly the recommendations of the Consultative Group, sent his final proposals to members of the Council. As of today, there are 56 Special Procedures mandates (44 thematic and 12 country-specific), and 80 mandate-holders (56% male and 44% female). During the general debate under item 5, held from 27-28 June, Brazil delivered a statement on behalf of a group of countries underlining the importance of dialogue in the negotiation of resolutions, so as to improve the Council’s efficiency and to help close the ‘implementation gap.’ Brazil noted that, given the increasing workload faced by many States, it is crucial that consultations are carried out in a transparent and open manner. Draft texts should be circulated as early as possible and core groups should hold at least two rounds of open-ended informal consultations. The need for greater inter-State dialogue was echoed by numerous delegations during the debate. Luxembourg, speaking on behalf of the Benelux countries, called on the President to take stronger action on allegations of reprisals and intimidation carried out against civil society actors for engaging with the Council. They called on him to ensure that reprisals and acts of intimidation receive public attention through public denunciation, and suggested that the Bureau maintain a publicly accessible register of such acts (on the extranet). They also called on the President to provide short oral updates on cases, including on action taken, at the start of agenda Item 5 each session, and to collaborate with Assistant Secretary-General Andrew Gilmour on specific cases. Bulgaria, speaking on behalf of the EU, expressed its full support for the work of the High Commissioner and his Office, and its expectation that OHCHR’s new Organizational Management Plan for the period 2018-2021 would allow the Office to adapt to the increasing number of demands, expectations and responsibilities placed upon it, thereby demonstrating the continued relevance of human rights mechanisms and country-level engagement. In a further statement, Uruguay, on behalf of a group of countries, reaffirmed the importance of strengthened cooperation between States and Special Procedures, especially in the context of improved follow-up on the implementation of recommendations. Uruguay also emphasised the importance of improving the quality of (and time allotted to) interactive dialogues with Special Procedures. The annual thematic discussion on technical cooperation in the promotion and protection of human rights, held on 4th July 2018, and mandated by HRC Resolution 36/28, focused on the theme of enhancing human rights technical cooperation and capacity-building to contribute to effective and inclusive implementation of the 2030 Agenda for Sustainable Development. In her opening remarks, Ms Georgette Gagnon, Chief of the Field Operations and Technical Cooperation Division of OHCHR, underscored the central importance of technical cooperation for the advancement of human rights and the achievement of the 2030 Agenda. She noted that targeted technical cooperation can help reach those left furthest behind first by addressing discrimination in law and in practice, and by promoting participation in decision-making. OHCHR is increasingly delivering capacity-building support in a manner that seeks to operationalise the linkages between human rights obligations and the SDGs. Portugal, speaking on behalf of the ‘group of friends on national implementation, reporting and follow-up,’ recalled the UN Secretary-General’s statement at the opening of HRC37, during which he underscored the urgent need ‘to reverse the current backlash’ against human rights, by focusing on the domestic implementation of the rich output of recommendations generated each year by the international human rights mechanisms. The Secretary-General also acknowledged that a key part of such a ‘global implementation agenda’ must be to integrate human rights recommendations into the overall UN planning and action, especially at national level through Resident Coordinators, Country Teams, and UN Development Assistance Frameworks. He also drew attention to the importance of improved human rights implementation for both his prevention agenda, and for the realisation of the SDGs leaving no one behind. Portugal, speaking on behalf of the Group of Friends, welcomed these points, especially the focus on national mechanisms for implementation, reporting and follow-up (NMIRFs). These are, it was argued, ‘the keystone of national implementation and impact…and of drawing links between human rights and the delivery of the 2030 Agenda.’ Portugal also underscored the important role of parliaments, NHRIs and civil society in supporting, overseeing and independently reporting on implementation and impact. Denmark, speaking on behalf of the Core Group on human rights and the SDGs, emphasised that the SDGs mirror the international human rights framework. It is important for all States to operationalize the close link between human rights and sustainable development in practice. In this regard, they suggested that recommendations and information from human rights mechanisms must be easily accessible to the wider UN system. Botswana drew attention to the ‘overwhelming’ reporting obligations faced by States and emphasised the need for greater synergies between different reporting mechanisms (which are, in the end, all designed to achieve the same goals). Botswana also noted the importance of improving access to the mechanisms for developing countries, by simplifying reporting obligations. Moreover, during the general debate under Item 10 (technical assistance and capacity-building), Italy, speaking on behalf of a number of States, reaffirmed the importance of universal participation in the Council’s work, and commended the achievements of the Voluntary Trust Fund for SIDS and LDCs. According to Italy, the Fund makes a significant contribution to the 2030 Agenda’s promise of leaving no one behind. The Marshall Islands expressed its gratitude as a recipient of the Trust Fund for SIDS/LDCs. It noted that as a Small Island Developing State, it does not have the resources or capacity to improve human rights in the absence of external expert assistance and support. It urged the international community to continue its efforts to promote universal participation at the Council, and to strengthen the delivery of technical assistance. Pakistan, speaking on behalf of the Organisation of Islamic Cooperation (OIC), explained that States are at different stages of development, and that confrontational attitudes are often counterproductive. Technical cooperation must instead focus on non-political positions and should support and supplement national mechanisms and institutions in upholding human rights, through meaningful and constructive engagement. The 38th session of the Council concluded with the adoption of 20 texts (all resolutions). This is 17 less than the number of texts (37) adopted at the 35th session in June 2017 (a 46% drop). This represents a significant decrease year-on-year and the lowest number of texts adopted by the Council during a June session since 2009. 30% of the resolutions were adopted by a recorded vote. 16 (80%) of the texts adopted by the Council were thematic in nature, while four (20%) dealt with country-specific situations. Of the latter texts, two addressed human rights violations under agenda item 4, and one sought to protect human rights through technical assistance and capacity building (under item 10). 13 of the texts adopted by the Council (65%) had Programme Budget Implications (PBI), requiring appropriations of $1,907,500 not previously covered by the UN regular budget (at the moment of writing). The 38th session of the UN Human Rights Council will mainly be remembered as the moment the administration of President Donald Trump pulled the US out of the Council. While some believe this was inevitable considering the Republican Party’s long-standing antipathy towards the body, others argue that it was the result of the failure, over the twelve months since Ambassador Nikki Haley’s visit to the Council in June 2017, to secure reforms of the Council’s agenda/programme of work, and of its elections/membership. Renewed US ‘disengagement’ from the Council (the US was similarly disengaged between 2006-2009, under the Presidency of George W. Bush) carries with it a number of risks, but also some opportunities. Regarding the former, there is a clear risk that the US decision will undermine the body’s credibility and effectiveness. For example, since 2009, the US has been the key actor at the Council in seeking to address situations of violations of human rights around the world (especially under item 4). With its withdrawal, there is a clear risk that this important aspect of the Council’s mandate and purpose will be even more neglected (to-date, only around 8% of Council resolutions have addressed situations of violations under item 4). The US has also, during its membership, been a champion of ‘civil society space’ and NGO participation at the Council – areas that may now come under increased pressure following its departure. However, perhaps the greater risk is to the US’s own credibility and influence, both in absolute terms and relative to its main geopolitical rivals. The historical example of 2006-2009 (the previous period of US disengagement) is, in this regard, instructive. At that time, the US tried – and largely failed – to influence key Council decisions from the sidelines (including the decision to include Israeli violations in the Occupied Palestinian Territories as a stand alone Council agenda item, and the decision to hold regular ‘special sessions’ on Israel). Notwithstanding, US withdrawal also presents a number of important opportunities for both individual States and for the Council as a whole. Regarding the former, with the US out of the picture, NGOs are likely to put greater pressure on other Western States, especially the EU and its members, but also Australia, Canada and others, to bring situations of violations to the Council’s attention (under item 4). There will also be an expectation that Latin American democracies will take responsibility for addressing situations of violations in the Americas. On this last point, it is noteworthy that HRC38 saw a strong cross-regional joint-statement on the situation in Venezuela, delivered by the Permanent Representative of Peru to the UN in Geneva on behalf of 53 States. It appears highly unlikely that a US-backed statement could have garnered the same levels of support. For the Council as a whole, there is a chance that US withdrawal may serve to reduce politicisation and division, meaning it can focus on fulfilling other key parts of its mandate such as supporting and following-up on the implementation of States’ human rights obligations and commitments, delivering human rights technical assistance and capacity building support to States, serving as a forum for international dialogue and cooperation on human rights concerns, and preventing violations and the escalation of crises. Some ‘Council watchers’ claim to have seen nascent signs of such ‘de-politicisation’ at HRC38 (e.g. 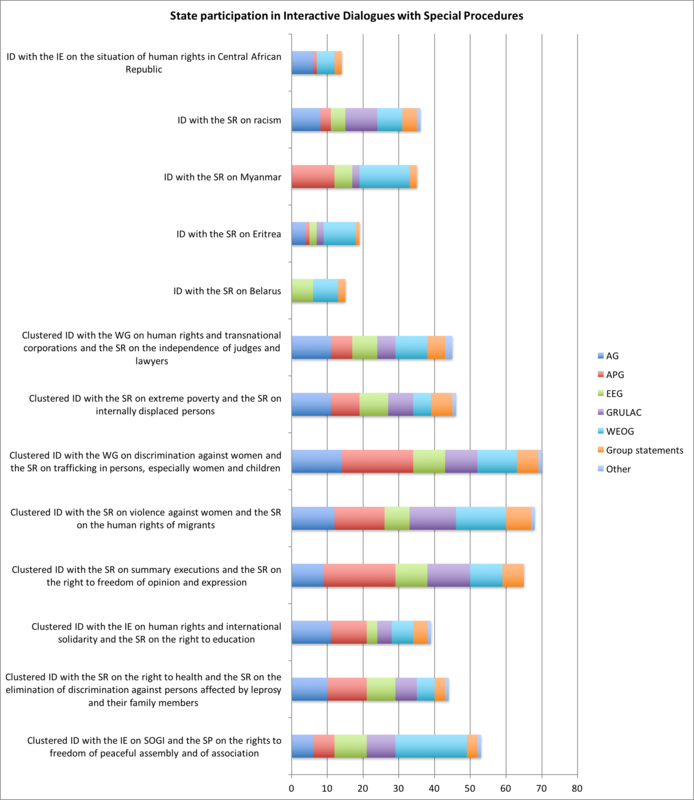 the adoption by consensus of the Ecuador-Peru resolution on the use of firearms). A important test case for whether US disengagement will have a net-positive or net-negative impact on the Council and its work is the new initiative on strengthening the body’s contribution to the prevention of human rights violations and the escalation of crises. Following two widely supported joint statements on the issue at HRC36 and HRC37, HRC38 saw Colombia, Norway, Sierra Leone and Switzerland table a resolution on ‘the contribution of the Human Rights Council to the prevention of human rights violations.’ The simple but important goal of this resolution was to begin an inclusive conversation at the UN on how the Council might better fulfil its prevention mandate, especially under paragraph 5f of GA resolution 60/251, both in its own regard and in combination with the other two pillars of the UN. Key to the success of this initiative will be to change mind-sets at the Council (which, to-date, has tended to neglect national human rights situations until they are deemed serious enough to warrant action under item 4): i.e. to move from reaction to prevention. This will in-turn necessitate the building of trust between States (as well as with NGOs). The basic premise of the new Council initiative is that the body should in future work with all States, on a voluntary basis, to help build national human rights ‘resilience’ – thereby preventing human rights violations from occurring in the first place (i.e. primary prevention). Primary prevention should include a significant increase in the UN’s ‘investment’ in resilience-building building around the world. Where patterns of violations nonetheless emerge in a given country, the Council should have urgent access to ‘early warning’ information, and should have the tools and procedures in place to rapidly reach out to, begin a dialogue with, and secure the cooperation of the concerned State and relevant regional actors, including by leveraging ‘preventative diplomacy,’ thereby reducing the risk of a widening or deepening of the crisis (i.e. secondary prevention). 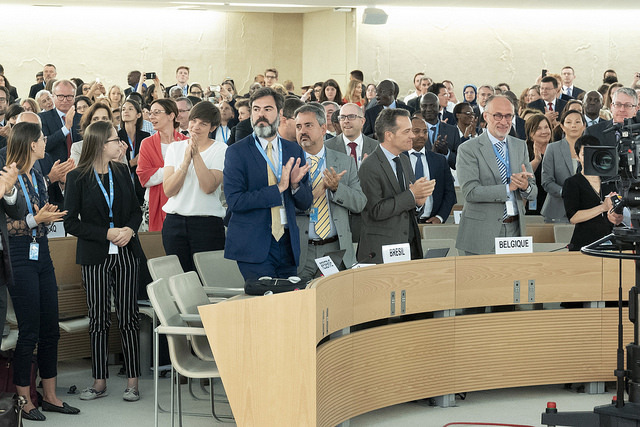 On the key question of whether the initiative formally launched at HRC38 succeeded in changing mind-sets or in building trust, the picture is mixed. On the one hand, there was wide recognition of the importance of the Council’s mandate under paragraph 5f, and of the related need to ‘do things differently.’ On the other hand, on-going disagreements about how to operationalize this mandate, both in a substantive sense (e.g. some understand the mandate solely in terms of providing capacity-building support to developing countries, others see it as an alternative means of bringing serious situations to the Council’s attention under item 4, while yet others understand it through a prism of conflict prevention or the ‘responsibility to protect’ (R2P)), and in procedural sense, meant that the draft text was the subject of a ‘hostile amendment,’ and was ultimately adopted by a vote (i.e. not by consensus). Looking ahead, it will be important for the process of consultations launched by the resolution, under the guidance of a chair-rapporteur and two rapporteurs, to be inclusive and to effectively reflect the views and concerns of all States, NGOs and human rights defenders, NHRIs, and relevant UN mechanisms and representatives, in a coherent set of proposals to be presented to the Council in March 2020. 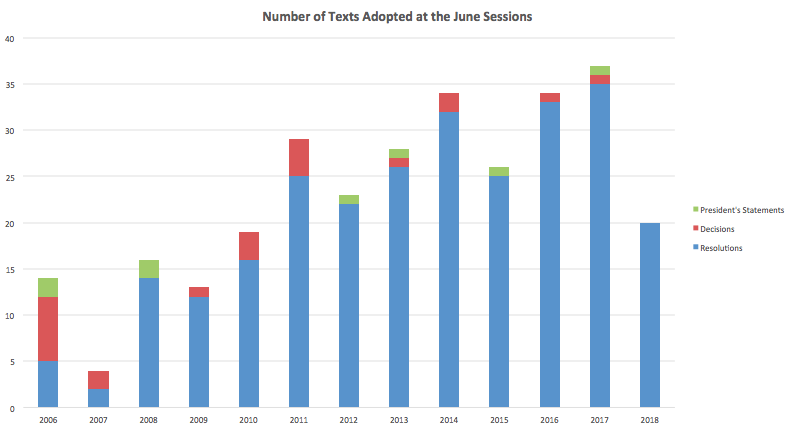 A final important development (amongst others) at HRC38 was the significant drop in the number of adopted texts compared to the last June session (37 to 20). At first glance (though it is impossible to say for sure based on the evidence of only one session), this appears to be the result of three years of Council efficiency drives, begun under the Presidency of H.E. Mr Joachim Rücker, as well as the current Council strengthening process (which includes a ‘rationalisation’ stream) being led by the current President, H.E. Mr Vojislav Šuc, and his Bureau. In principle, these efficiency gains should free up space on the Council’s agenda, allowing States, NGOs and others to improve dialogue, and to focus on strengthening the body’s long-term effectiveness and impact. 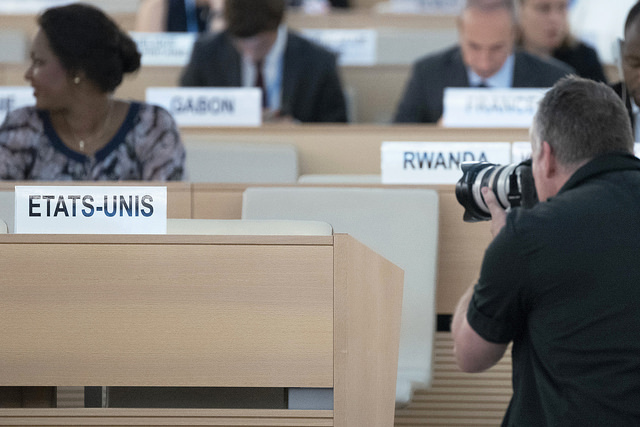 Featured photo: A photographer taking a photo of the plate of the United States of America at the 38th Regular Session of the Human Rights Council. 20 June 2018. UN Photo / Jean-Marc Ferré, licensed under CC BY-NC-ND 2.0. Standing ovation all Delegates for Zeid Ra’ad Al Hussein, High Commissioner for Human Rights at the 38th Regular Session of the Human Rights Council. 18 June 2018. UN Photo / Jean-Marc Ferré, licensed under CC BY-NC-ND 2.0. 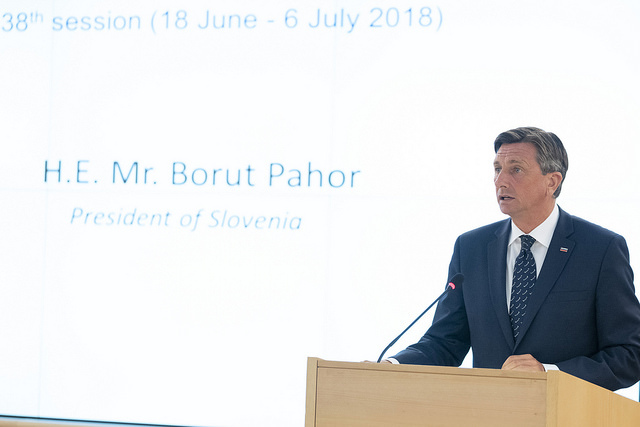 Borut Pahor, Président of Républic of Slovénia at the 38th Regular Session of the Human Rights Council. 20 June 2018. UN Photo / Jean-Marc Ferré licensed under CC BY-NC-ND 2.0. Ivana Radacic,, Chair of the Working Group on the issue of discrimination against women in law and in practice present his report at the 38th Regular Session of the Human Rights Council. 20 June 2018. UN Photo / Jean-Marc Ferré, licensed under CC BY-NC-ND 2.0. 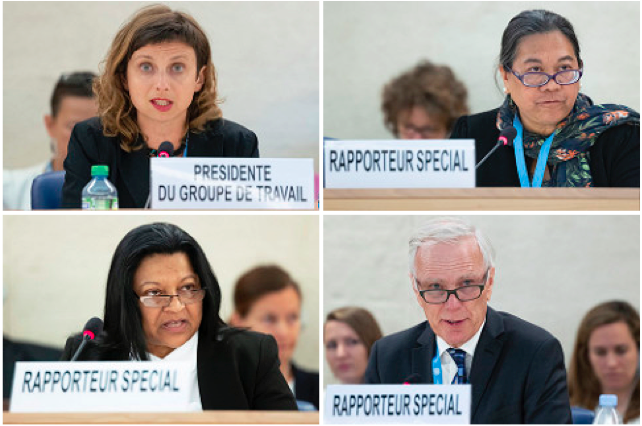 Cecilia Jimenez-Damary, Special Rapporteur on the human rights of internally displaced persons, presents her report at the 38th Regular Session of the Human Rights Council. 22 June 2018. UN Photo / Jean-Marc Ferré, licensed under CC BY-NC-ND 2.0. Sheila Keetharuth, Special Rapporteur on the situation of human rights in Eritrea present his report at the 38th Regular Session of the Human Rights Council. 26 June 2018. UN Photo / Jean-Marc Ferré, licensed under CC-BY-NC-ND 2.0. Philip Alston, Special Rapporteur on extreme poverty and human rights present his report at the 38th Regular Session of the Human Rights Council. 22 June 2018. UN Photo / Jean-Marc Ferré, licensed under CC-BY-NC-ND 2.0.